Tricycle aside, the “fun” quotient was hard to spot. But I couldn’t help but register a certain historical significance to the operation humming inside this enormous building erected in the industrial flats of Phoenix. 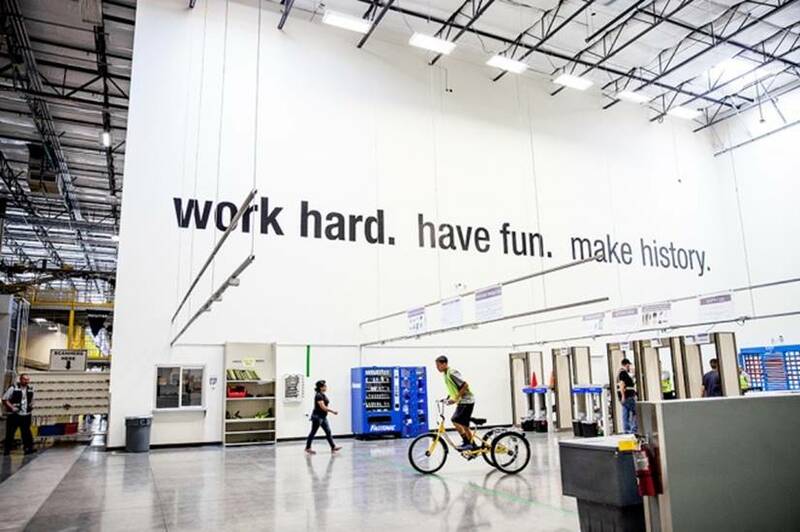 The Amazon warehouse–known in company jargon as a “fulfillment center,” or FC–is a uniquely 21st-century creation, a vast, networked, intelligent engine for sating consumer desire. The FC is the anchor of Amazon’s physical operations, the brick and mortar behind the virtual button you tap on your phone to summon a watch or a shirt or a garden hose or Cards Against Humanity or just about anything else to your doorstep. Unlike past advances in retail gratification–the emergence of the supermarket in the mid-20th century, say, or the more recent rise to dominance of Walmart superstores–the workings of Amazon are almost entirely hidden from view. Amazon doesn’t want customers focused on the mechanics of its seemingly magical powers. But last month, the company gave WIRED a rare glimpse into one of the more than 90 warehouses it operates across the globe, looking to show that its fulfillment machine is finely tuned not just to serve Amazon itself but anyone else who wants to sell stuff on its site. 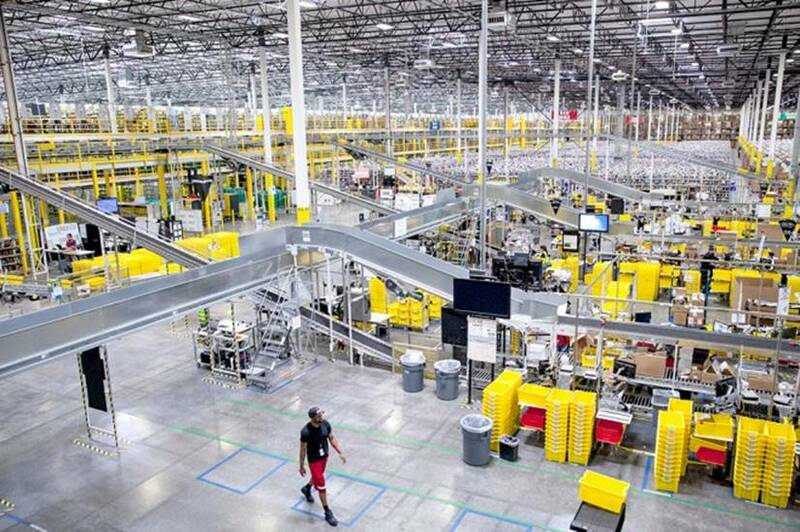 THE AMAZON WAREHOUSE IS A UNIQUELY 21ST-CENTURY CREATION–A VAST, NETWORKED, INTELLIGENT ENGINE FOR SATING CONSUMER DESIRE. Through a program called Fulfillment by Amazon, or FBA, the world’s largest online retailer not only lets other sellers list their items on its website but lets them outsource shipping as well. As we saw when we toured the Phoenix facility, third-party products come into the fulfillment center like any other inventory and sit on the same shelves as stuff sold by Amazon itself. Then these products can also go out the door just like Amazon inventory. Sellers even have the option of offering free two-day shipping through Amazon Prime. The arrangement lets Amazon vastly increase its selection without sinking its own money into inventory while laying the groundwork for a potentially pervasive change in the way consumer goods are bought and sold. In the past, sellers just worried about competing with companies like Amazon. But by opening its fulfillment centers’ doors to them, Amazon is offering businesses access to an infrastructure they could never replicate on their own. Fulfillment by Amazon is strangely reminiscent of another big Amazon idea. Through its Amazon Web Services (AWS)–a menu of products that pioneered the idea of cloud computing–the company has transformed the internet startup economy by opening up its digital infrastructure to anyone. Now, instead of spending wasteful amounts of money and time on backend basics, startups can simply pay Amazon to manage their servers for them. Freedom from IT tedium has created the foundation for companies like Netflix, Dropbox, and Foursquare to prosper. In many ways, Fulfillment by Amazon is like a physical version of AWS. Through the engineering of its fulfillment centers, Amazon has built the world’s most nimble infrastructure for the transfer of things, a logistics platform that dramatically amplifies any one person’s ability to move matter to anyone else. As Amazon expands that capacity to include its own trucks and someday flying drones, the physical reach it can offer other businesses extends even further. Much in the way cloud services and the data centers that house them have become the foundation of doing business online, Amazon’s fulfillment centers have the potential to become the networked hubs of the consumer economy, the biggest of big boxes that free up businesses to focus on making things rather than moving them. Entering the fulfillment center in Phoenix feels like venturing into a realm where the machines, not the humans, are in charge. Also known by the codename PHX6, the place radiates a non-human intelligence, an overarching brain dictating the most minute movements of everyone within its reach. At 1.2 million square feet, PHX6 consists of two fulfillment operations working as mirror images of one another, a redundancy that lets the FC scale up or down in response to rising and falling demand. A central mezzanine provides panoramic views of both sides of the warehouse, the back walls obscured in the distance. An impossible-to-trace web of conveyor belts and rollers shuttle the ubiquitous yellow totes–the basic logistical units of an Amazon FC–from one point to another, filled with goods destined for warehouse shelves or for customers. ALSO KNOWN BY THE CODENAME PHX6, THE PLACE RADIATES A NON-HUMAN INTELLIGENCE, AN OVERARCHING BRAIN DICTATING THE MOST MINUTE MOVEMENTS OF EVERYONE WITHIN ITS REACH. In the midst of all this, next to a box of police-themed Legos and several shrink-wrapped copies of the Spiderman movie trilogy on Blu-Ray, we find a fog-free shower mirror made by ShaveWell. ShaveWell is a small business based in Knoxville, Tennessee, that Amazon touts as one of its third-party success stories. The company is run by Bill Vogel, a former financial services executive who didn’t feel like moving again after his last job was eliminated, especially for the sake of his son, who suffers from a neuromuscular disease that requires him to use a wheelchair. Vogel says he was at an Atlanta trade show for gear for his son when he had an epiphany: the U.S. had a lot more manufacturing capacity than was being used. Vogel decided he would use some of that capacity to make something. And he turned to Amazon to sell it, tapping into the leverage offered by Amazon’s site and FBA. ShaveWell ships its mirrors to Amazon, and the company distributes them across its network of fulfillment centers, including PHX6 in Phoenix. At an Amazon FC, “inbounding” is nearly as important a process as shipping orders out. Trucks arrive with boxes of goods that workers open, scan, and put into totes. Conveyors route the totes to different parts of the warehouse, where other workers unload them, scan them again, and then scan the barcode of the cubby where they’re stored. Now the FC “knows” where to find the ShaveWell mirror or anything else when a customer places an order. The inventory at PHX6 is made up largely of “smalls,” merchandise small enough to be stored on shelves about the size of those at a typical library, which is exactly how Amazon refers to the levels of seemingly endless metal shelving at PHX. Each shelf is divided into small cubbies, and each cubby gets a barcode and an alphanumeric ID, much like the Dewey Decimal System. It was in one of these that we found the ShaveWell mirror. ITEMS ARE SIMPLY SHELVED WHERE THEY FIT, WITH IDENTICAL COPIES STOWED IN SPOTS THROUGHOUT THE WAREHOUSE. But unlike the Dewey Decimal System, the codes don’t signify anything about the category of what’s in the cubby. Items are simply shelved where they fit, with identical copies stowed in spots throughout the warehouse to make them accessible to make it less likely a worker will have to travel far to find one. Every order funneled from Amazon’s website to PHX6 is relayed to a handheld scanner carried by all workers in the library, or “pick mods.” The scanners direct the workers to the cubbies where the ordered items are stored. The item is picked, scanned, then placed into a tote, which is also scanned. When a tote is filled, it travels along a conveyor system made up of ramps, long straightaways, and towering corkscrews to get prepped for shipping back out into the world. Ultimately, the tote arrives at one of many pre-packing stations. At the ones we saw, workers sorted items into small slots on tall, wheeled shelves. Each slot represents an individual order. Those shelves are then rolled to packing stations, where another worker packages orders into the cardboard boxes familiar to anyone who has ever ordered from Amazon. Amazon charges third-party sellers for shelf space down to 1/10th of an inch and takes a cut of orders shipped. Vogel and others say the cost is well worth the speed and convenience that Amazon provides. “Utilizing the fulfillment network takes a lot of the heavy load off our backs,” says Joe Jaconi, whose company, Tech Armor, ships its smartphone screen protectors and cases straight from factories in Asia to an Amazon hub in Kentucky. When the company started in 2012, Jaconi says, he and his co-founder were writing delivery labels by hand. Last year, Tech Armor sold 2.5 million units, almost all through Amazon. Despite the success stories Amazon is eager to share, not every third-party seller on Amazon is happy with the experience. Some sellers accuse Amazon of capriciously jacking up its fees, and one lawsuit alleges the company encouraged third-party sellers using Amazon Prime to raise their prices without telling them the increases were mainly to defray Amazon’s shipping costs. Another common complaint seen on seller message boards is that Amazon will come in and undercut third-party sellers on price once an item they’re selling becomes popular. Amazon, the argument goes, lets third parties take the risk but then makes it impossible to compete. But Peter Faricy, Amazon’s vice president of marketplace, doesn’t see it that way. “The stories you’ve heard about competing with Amazon are really not the full picture,” he says. “A lot of our sellers have successful strategies for really serving customers well on Amazon.” Faricy says third-party sellers face competition not just on the site but across the internet. A COMMON COMPLAINT SEEN ON SELLER MESSAGE BOARDS IS THAT AMAZON WILL COME IN AND UNDERCUT THIRD-PARTY SELLERS ON PRICE ONCE AN ITEM THEY’RE SELLING BECOMES POPULAR. In that contest, he argues, the opportunities, tools, and conveniences they gain selling through Amazon gives them major advantages. “You can self-service register on Amazon tonight and in the U.S. reach over 100 million customers,” Faricy says, and more than 240 million customers globally. But thanks to its ambition, Amazon has also put itself in a position of constant peril. The retailer has created the expectation that it will indeed have everything. Shoppers take for granted that Amazon will have what they want. The only time they notice is when Amazon doesn’t. “The biggest failure you can have is not to have what they’re looking for,” says Scot Wingo, CEO of ChannelAdvisor, which makes cloud-based software for third-party sellers to analyze their sales and marketing campaigns on Amazon, eBay, Google, and elsewhere. Starting in 2006, the rate of Amazon’s sales growth took off, an upswing Wingo credits to the launch of unlimited 2-day shipping through Amazon Prime the previous year alongside the rise of the company’s third-party marketplaces. The arrival of third-party sellers fueled an “explosion in selection,” Wingo says, that also gave Amazon a powerful way to hedge the risk of stocking products too far out along the long tail of marginal popularity. Instead of sinking its own money into inventory that might sit for 60 days, Amazon could let someone else fill in that gap. AMAZON CREATED “INTERSECTING FLYWHEELS” THAT ENCOURAGED THE GROWTH OF THIRD-PARTY SALES WHILE AT THE SAME TIME CONSOLIDATING ITS BRAND. Ensuring the consistency of that Amazon experience is the clear purpose that drives the fulfillment-center machine. You see this not only in the way that Amazon has automated so much of the system, but in the rapid-fire way that warehouse workers physically move and package items. The packing stations are a whirl of activity where algorithms test human endurance. Orders stream down a computer screen that indicate the proper box size for each. Rollers spit out the bags of sealed air used to cushion items in the boxes and the tape to seal them. Workers whip through the folding, packing, and sealing of boxes at a speed that could only come through days, months, and years of practice. The pace cannot slow if Amazon wants to meet the demand the company itself has stoked through the speed and reliability of its fulfillment operation. This is the irony of work in an Amazon fulfillment center: the end result of doing your job consistently well today is that customers will expect that tomorrow Amazon will do it faster and better. Once packed, boxes head down another belt beneath a labeling machine that prints and sticks mailing labels in one swoop. Now sealed and stamped, orders are shunted down their final chutes to await loading onto trucks, a Tetris-like task that involves packing the boxes as tight and straight as possible for delivery to UPS, FedEx, and other shippers. Such power and speed can come at a grave price. Amazon is facing a federal investigation into the death of a worker at a Pennsylvania fulfillment center who was reportedly struck and pinned by a pallet jack she was operating. Much has also been written about how the unrelenting nature of Amazon’s fulfillment system can fosterexploitive, sometimes hazardous working conditions that have become the target of at least one set of class-action lawsuits. At PHX6, the climate was temperate, all the more remarkable considering the blazing Arizona sun outside. Natural light streamed from skylights, though the walls were windowless. Water seemed readily available. But like any assembly line, the point of Amazon’s fulfillment system isn’t comfort or creativity but precision–a Taylorist approximation of machine-like behavior by people. Even the one seeming signifier of tech-company whimsy is purely practical: the giant tricycles have baskets where maintenance workers could put their tools while they traversed a space the size of 28 football fields from one job to the next. THE POINT OF AMAZON’S FULFILLMENT SYSTEM ISN’T HUMAN COMFORT OR CREATIVITY BUT PRECISION–A TAYLORIST APPROXIMATION OF MACHINE-LIKE BEHAVIOR BY PEOPLE. In a way, an Amazon fulfillment center is like a giant robot, and the way to streamline it would be to roboticize as much of the work as possible. Amazon is slowly working to incorporate more robots into its warehouses, but human hands and brains are still the best tools for many jobs. Ultimately, the company has the algorithmic intelligence to determine what balance of robots and people to strike to keep its global machine moving at peak efficiency. For now, that on-the-ground superiority means Amazon is defining the 21st-century consumer experience. That power will keep other sellers flocking to cast their goods into Amazon’s flow, like sticks tossed into a rushing river. And everything about Amazon seems angled toward breaking through the logistical barriers holding that river back. Amazon’s warehouses are designed to be wish-fulfillment machines, calibrated to feed our consumer wants with aggressive speed and precision at a scale that has yet to find its limit. We keep supplying more wishes to Amazon, and Amazon keeps turning them into more stuff.